One problem with this process is that sometimes the screen is wider or taller than other times. That’s because many screens have a movable black curtain on the sides, top and bottom. These curtains, called ‘masking’, change positions depending on how the movie is supposed to look. There are two main categories for movies, Flat and Scope. Flat is more square, so the apparent screen height goes higher, and the sides come in to make the screen more narrow. Scope is obviously more wide than tall. In a general sense, Scope allows more scenery and space around the actors, and Flat keeps the actors at the center of the story. There is another technique that we won’t discuss but it should be known in case you have to deal with an engineer. They might say that you need to sit some place where your viewing angle is between 45 degrees and 60 degrees. If you want to get the tools to measure this, have fun. This may be the most natural distance since it puts the edge of the screen at a comfortable position. You see everything onscreen without seeing too much of anything else – especially those glaring EXIT signs! But it still doesn’t easily put you in the same row consistently, or make it easy to tell another person who is trying to do the same thing as you. There is another method that technicians use for the measurement point. They say ‘two-thirds back’. This means that they will divide the length of the auditorium by 3, then multiply by 2, and place their equipment there. 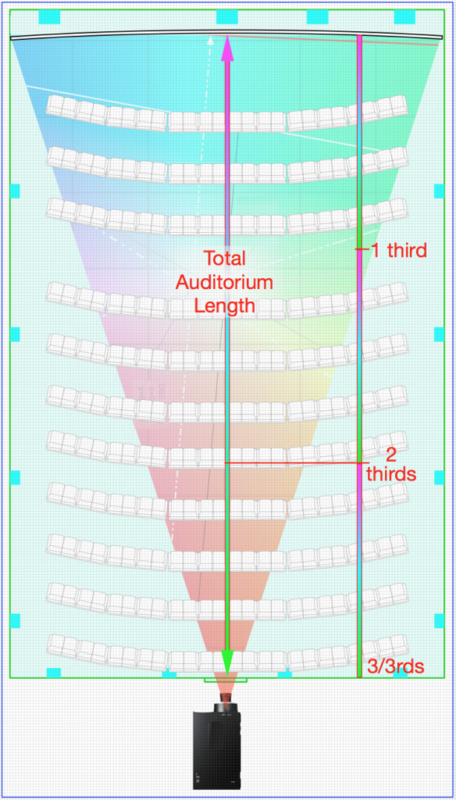 Imagine that the auditorium is 90 feet long, you divide by 3 to get 30 feet, then multiply by 2 to get 60 feet. Go 60 feet from the screen, walk to the center of that row and set up for your testing. Easier to write than do? Because who really knows the length of the auditoriums? 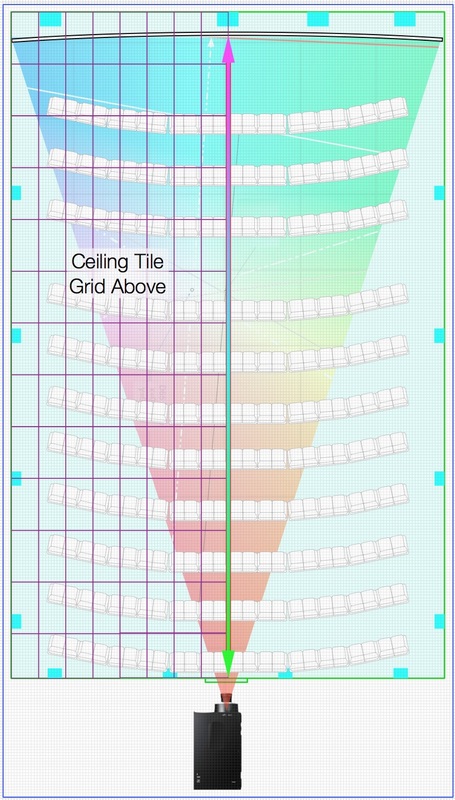 One way to figure out the length is to count the ceiling tiles of the auditorium. Count them, divide by 3 to get the 1/3rd amount, and count them again from the back wall until you reach the 1/3rd amount. Find the closest convenient row, walk to the middle, get comfortable. You are 2/3rds back! In the example here, we look up and count – there are 12, almost 13, tiles from front to back. If we divide by 3 we get 4-plus a little. We go to the back, count forward 4 plus a little. Look down and choose the most convenient row to sit in. Walk to the center seat. Oh, and where is the center seat? Look up to see the port window that the projector shines though. That will almost always be the center of the screen. If the screen isn’t in the center of the room – for example, if there is an exit door on one side of the front wall – the center of the room for the sound system will be a couple of feet to one side of the port window. But it really won’t make a difference for these simple tests. Here is the most important part: Have fun. Notice a little more each day. You represent the customer, you represent the movie makers, you represent the cinema owner’s desire and responsibility to give the best presentation possible. Be proud of that. Let’s talk about that Online Checklist next, OK?